Cute baby sock coin purse, a funky snap coin purse range that is just the cutest way to store your spare change or to pop a key in! 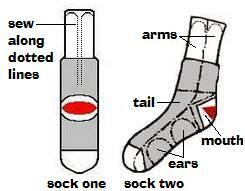 Cool sock purses and sock key chains to buy online for kids, teenagers, and anybody who loves socks. Adorable tiny purses made from little socks. These baby sock purses come in a fun variety of colors and styles. Pink ballet slippers, little red ladybugs, cats, dogs, cute monkeys on blue and pink stripes and a cute little green frog. Now these two purses I separated just so I could mention that I have actually made sock monkeys out of socks similar to these. Not baby sock size (that could have proven to be rather frustrating as they are so tiny) but I made them from larger size socks. 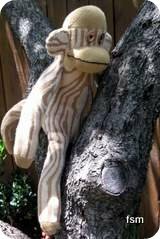 So, if you are interested in seeing how you can create a sock monkey doll to match your sock purse, I can show you how to make a unique homemade sock monkey toy made from high top socks (you can use brand new socks or used, I used new) or a friendly sock monkey doll made from piano key style socks . 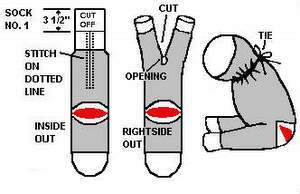 Both are handmade and are original variations based on the Traditional Red Heel sock monkey pattern.